Fly fisherman and sight-challenged anglers probably have heard of a tool used to help thread small line through eyelets of jigs and hooks. If you’re looking for a tool like this, you’ll want to try the TYEPRO and TYEPRO - Fly & Ice. Jigs: 1⁄64 oz. to ½ oz. Flies: Most flies ranging from size 2 in. to 16 in. After testing out these new tools, we found a few pros and cons. For small crappie jigs, the TYEPRO worked great when the eyelet has a long neck. 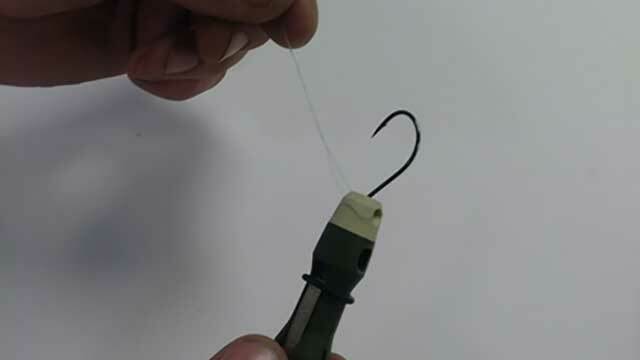 However, when the eyelet has a shorter neck, creator Tom Vandewalle recommends pushing the jig hard against the soft-gripping tip on the TYEPRO. We also experienced issues with eyelets on top of the jig head when testing, but I think that is from not pushing hard enough or the neck was too short. We had two testers for the TYEPRO Fly & Ice and I received mixed reactions on ice jigs. One tester said the tool didn’t work. The other tester said it did work, once he figured it out. When it came to fly fishing though, both testers agreed the TYEPRO Fly & Ice would be a very handy tool. The eyelet funnel on the TYEPRO and TYEPRO Fly & Ice tools allow for small fly line and fishing line to be threaded through the eyelets of most jigs and hooks mentioned above. The soft-gripping tool on the end is soft enough that any shorter neck hooks and jigs will line up better. The stainless-steel line clipper is handy to trim tag ends when finished tying off a hook or jig. Note, that the clipper is not designed to cut braid. The lanyard allows you to keep it around your neck should you need to get to the TYEPRO quickly. Overall, it had mixed reviews but in the end, it was determined the TYEPRO and TYEPRO Fly & Ice pros outweighed any of the negatives. The cost of these tools is $14.99 plus shipping, and if you order two, shipping is free on their website. All testers agree this can be quite a useful tool to fly fisherman and some anglers. For more information, please visit www.tyepro.com.